The graph below illustrates the fact more than 55% of Apple’s revenue in the first nine months of the current fiscal year was delivered by the iPhone line. In FY2013, the iPhone generated 53.4% of reported revenue and in FY2012 the iPhone represented about 50% of the company’s revenue total. There’s rampant speculation Apple will soon announce a mobile payments service and other services related to the much-anticipated iWatch line of accessories. As the graph below reveals, Apple’s iTunes/Software/Services segment is delivering more revenue on a year-over-year basis while the Accessories revenue segment is growing but at a slower annual rate. For the first nine months of the current fiscal year, the two segments combined for $18.062 billion of revenue or about 12.84% of Apple’s revenue total. The introduction of an iWatch as a component of Apple’s Accessories segment or as a standalone revenue segment may add billions of dollars to Apple’s top line. In total, the revenue generated from an iWatch line of accessories might rival the revenue growth to be delivered by the iPhone line next fiscal year and materially increase the company’s aggregate revenue growth rate. However, the total revenue contributed by the iWatch line of accessories in FY2015 might not match the revenue growth delivered by the iPhone 6 next fiscal year. Apple’s return to profit growth in the March quarter was due in large part to recovery of gross margin. 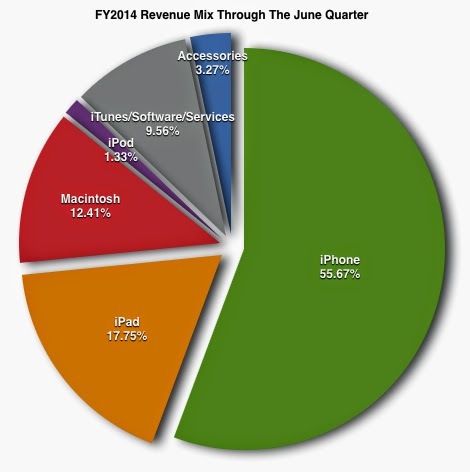 The graph below details Apple’s gross margin performance over the most recent nineteen fiscal quarters. The iPhone delivers the highest gross margin of Apple’s major product lines and success of the iPhone 6 will further the company’s gross margin recovery. Illustrated below is Apple’s net income performance as a percentage of revenue over the same 19-quarter period. Although Apple has returned to profit growth, net income growth in the March and June quarters was moderated slightly by rising R&D expenses. R&D expenses as a percentage of revenue rose dramatically in the first nine months of the current fiscal year. This portends not only the pending announcement of new accessories and services, the percentage of revenue consumed by R&D expense will fall precipitously beginning in the December quarter. The success of the iPhone 6 combined with the revenue generated by the iWatch line of accessories will diminish the percentage of revenue consumed by R&D expenses even if the rise in R&D expenses continues. Apple’s deferred revenue balances rose during the first nine months of the current fiscal year as the company deferred more revenue from each Macintosh and and iOS-based device sold. The graph below illustrates Apple’s quarter-ending deferred revenue balances over the most recent eleven fiscal quarters and the change in the deferred revenue on a year-over-year basis. As Apple moves past the first year of change in the amounts deferred per unit sold, the impact of deferred revenue on each quarter’s reported revenue and gross margin will continue to diminish. Expectations are high for the success of the iPhone 6. It’s widely reported the company will release new iPhone handsets with larger displays and with NFC chips to facilitate a new mobile payment program. At present Wall Street expects revenue for the fiscal year ending next month of just over $180 billion and about $197 billion in revenue for the fiscal year beginning at the end of September. However, Apple will most likely deliver revenue growth next fiscal year at a rate greater than the 9.40% currently expected by the market. I expect revenue next fiscal year to well exceed $200 billion due to the success of the iPhone 6 and the release of the long-awaited iWatch line of accessories. I expect gross margin to be stable and supported by a diminishment of the impact on reported revenue from deferred revenue as Apple moves past the first year of higher amounts deferred on each device sold. R&D expenses as a percentage of total revenue will also diminish next fiscal year although R&D expenses may continue to rise. Apple’s net income record of $41.733 billion was set in FY2012. The success of the iPhone 6 combined with the release of the iWatch line of accessories, continued unit sales growth for the Macintosh line as well as some growth in iPad unit sales year-over-year may deliver a new net income record for Apple next fiscal year. Record revenue, the potential for record net income and the ongoing reduction in the fully diluted share count will all be catalysts for further share price appreciation. The high percentage of revenue delivered by the iPhone 6 in FY2015 will serve the company well as management delivers new products and services beginning this fall that over time will generate a rising percentage of the company's reported revenue total. The iPhone line will again deliver high gross margin and will be the primary catalyst for strong net income gains and potentially the highest net income total in the company's storied history. While we all look for spectacular results from the forthcoming iPhone 6, the introduction of the iWatch line and Apple’s foray into mobile payments, there are more subtle factors as detailed in this article that will also reward long-term shareholders over the next several quarters.